We said earlier that picture framing is as much a science as an art – well, here’s where the “art” part comes into play. A rhesus monkey can pick out a white top mat, a blue inner mat and a wooden frame for your print – and maybe that’s just what you need. We can certainly do that. But – what if you want something … more? How about something that makes you say, “Wow!” and makes you smile every time you walk by it as it hangs on your wall. That’s what the designers and framers at The Art Shop do every day. Our numerous regional, national and international custom picture framing awards by the PPFA (Professional Picture Framers of America) will attest to that. 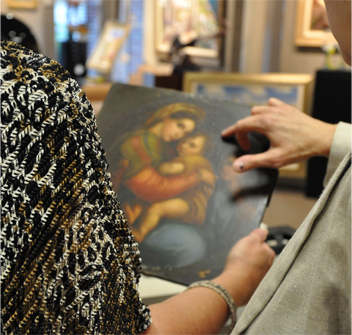 From the simplest framing of a $10 poster to a complicated shadowbox with artfully arranged priceless antiques, our designers and framers can select the perfect frame design to enhance your prized artwork. Let’s say you have something framed, someone knocks it off your wall and it breaks or the art slips off its mount. 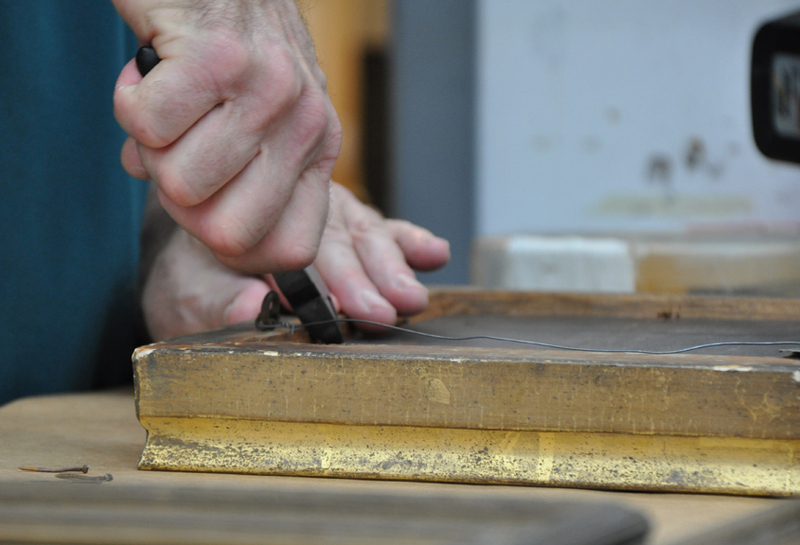 (In a preservation mount, the art is attached to a backing board with linen hinges. 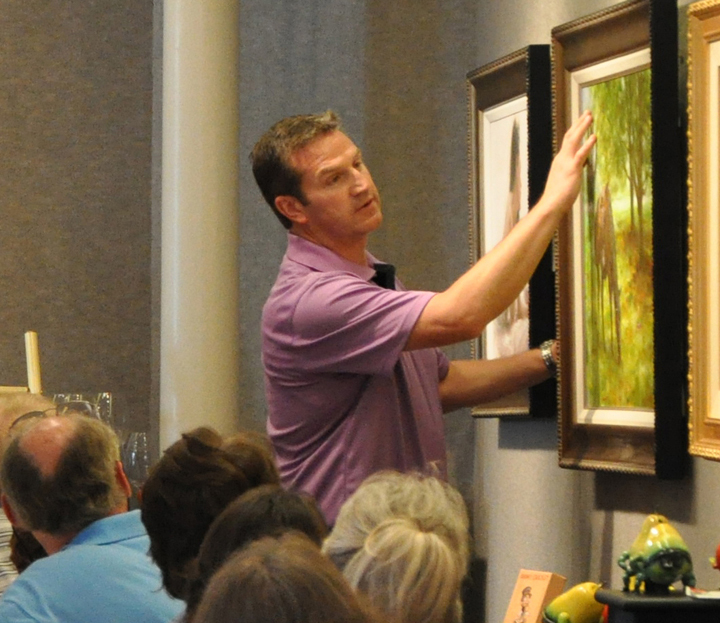 Gluing it down or dry mounting a valuable piece of artwork will destroy its value. We’ve seen it done, believe me.) You try to take it back to the framer, but lo and behold, they have gone out of business. The Art Shop has been here since 1899 – the second oldest business in Greensboro. We hope to be here another 100 years (although not with the current owners – we’d be too old!). Our framing is guaranteed for life – yours and ours! The Art Shop’s prices are competitive – we wouldn’t be in business this long if they weren’t. However, generally speaking, 60% off an inflated price (as many of our big box competitors advertise) will not save you money – especially in the long run. In our 115 years in the business, we have “fixed” many 60% off framing jobs. Wanting to preserve, protect and enjoy your precious photo, print, diploma, child’s drawing or original oil is why you have it framed. With our EXPERIENCE, CREATIVITY and LONGEVITY, The Art Shop is where you should take it. Call the Man, Aunt Bea! Husbands and Wives Painting TogetherWhat is a Giclee?